It’s still hard to describe how unreal it feels to be a part of the lives that have been touched by a man in the pink tutu. In December when the Buzz Feed article went viral, we received hundreds of inbound emails and orders from new fans. But one in particular called our attention. Cathy, the founder of Sofia’s Angels, sent an email that really intrigued me. She wanted to fund raise for the Carey Foundation under one condition – that her “Angels” could come to New Jersey for a picture with Bob and Linda. All I could say was “Is that a trick question”? We ironed out the details, and a week later Cathy asked if she could dedicate a Cathy’s Creations jewelry piece in honor of our breast cancer non-profit organization, the Carey Foundation. Uhm, another trick question? Within weeks of our first conversation, Cathy and her “Sofia’s Angels” network had raised a few thousand dollars for us. Linda and I kept asking ourselves if this was real. 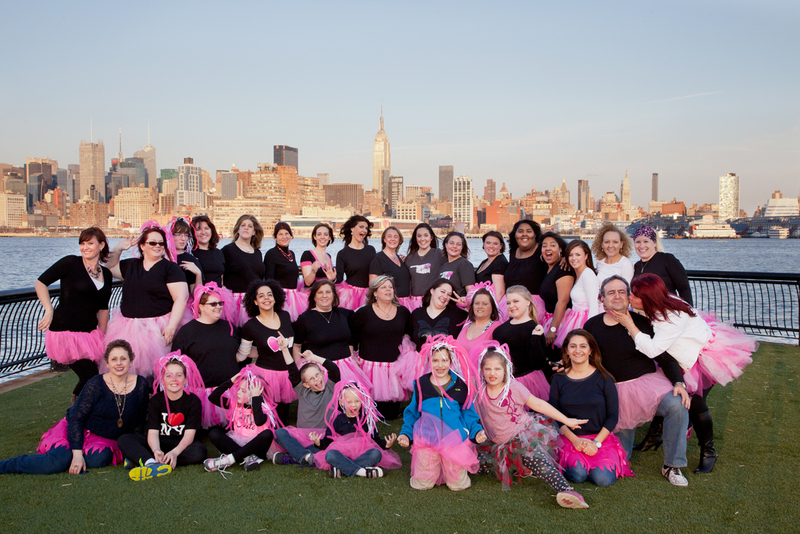 But on that Saturday afternoon when we watched over thirty women from all over the United States, and yes – even Canada, stroll into City Bistro in Hoboken for this fund raiser, we could no longer doubt that the magical Cathy creature is real. Cathy O’Grady is furthest right (white jacket). Cathy’s motivation is completely aligned with who we are. She’s here to change the world’s perspective, and we are honored to be a part of that. But O’Grady says she was truly inspired her to commit her life to performing random acts of kindness after her mother’s death from breast cancer 15 years ago. Thank you for your dedication Cathy, we are honored to have you in our family and to be a part of your mom’s legacy. Was thrilled that my grandaughter, Logan, and a friend were able to make that trio with Cathy. Such a special lady! This was one of the best weekends I have ever had. I not only got to participate with my dear friend Cathy O’Grady ,who has taught me how to be selfless, but I met some of the most amazing women that will always be part of a special “sisterhood”. Bob and Linda, there are no words to describe your love, courage, dedication and beauty. Most of all, I was able to share this along with two of my lovely daughters Anais and Digna and my childhood best friend Laurinda. Lastly, my dear , dear sister’s Sofia’s Angels…love you all to the moon and back! I have never encountered a more warm and loving couple like Bob and Linda. The moment I reached out to them and got an immediate response from Marcela, their business manager, I knew that it was an organization I wanted to align myself with and do everything possible to raise awareness and funds for The Carey Foundation. There are no words to express the joy I have for getting to know Bob, Linda, Marcella, Cathy and the fabulous ladies called Sophia’s Angels. To be included has changed my life. I believe so strongly in each and every one of you. The icing was getting to run around together in New Jersey wearing a tutu. Can’t wait to see what the future holds for us. Just exciting. Such an honor and a privileged to be part of such an amazing event.